Earlier topic: My Golding wants Another Chase! I found an antique Kelton etching press with a 26 x 54 inch bed on Craig’s list that I am delighted is now in my possession. I know very little about the press except that she is a beauty. Under the name M M Kelton Sons there is an address of 124 Baxter St, New York. I have spent a good deal of time googling Kelton but have come up with very little. Does anyone have any ideas about the company and when it was manufactured? I have a Kelton D-cylinder press, but I have not been able to find much info about the Kelton company. I do have, from Robert Steffen’s “Engraved Stationery Handbook” (New York, Cronite Company, 1950, p. 355-358), a brief description of how to make these presses ready and print on them, and I would be glad to share this with anyone who would like a copy. Steffen’s book is also sold by Caslon Limited, St. Albans, Hertfordshire, G.B. 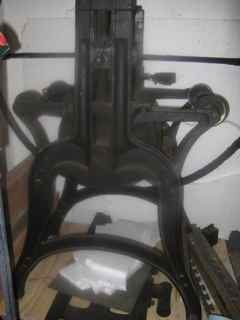 ; no price is listed on the net (navigate caslon.uk.co to “diestamping” — “etching supplies.”) These presses are used for demonstration at the Bureau of Engraving in Washington D.C., and it is well worth a visit to see them in operation. There, they are set up for printing on dry paper from thick steel plates and have a hard blanket mounted on the cylinder. The printer I spoke with said that Manning Board was used to pack the cylinder. Over the Manning Board, they place a rubber-coated draw sheet, and I was told that either Cambric material or a printing blanket from an offset litho press would work. Judging from a photo I once saw, the Bureau of Engraving was full of these presses at one time. I use mine as a conventional etcing press. I Own a Kelton Press, they were patent 1855 have copy from U.S. pat office. They were used by American Banknote and B.E.P. to print security documents and banknotes, stamps etc, for years 1854-1910 as production presses called Spider Press Style, and later as proving presses, still today in use at B.E.P. John Hope Company also made many Engraving machines:ruling and pantographs. I have seen Kelton Press at The B.B.Co. in Canada as well. Most diappeared during W.W.II for scape metal and due to newer tech. I have a D-cylinder as well, with a 20” x 40” bed. I found it on e-bay 9 years ago. I have been able to find very little information on the internet in that time. I’ve read the Smithsonian has some in the museum. Any other information about them is most appreciated. Above posts are very interesting. 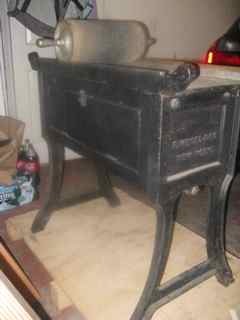 I just found a 16” Kelton D-Cylinder press and am also looking for more info especially on refurbishing it for copperplate printing. Has anyone eliminated the D cylinder and replaced it with round?replaced the bed? I’ve acquired a Kelton recently; it came in parts without the bolts and screws (and was correspondingly cheap). Anyone know if the threads are standard sizes? Also, I’d be interested in any info or documentation you may have on it such as in the above mentioned Engraved Stationery Handbook. I haven’t been able to find much. Saw your blog and was impressed with your restoration. Mine is in pieces and is missing all bolts and screws, and apparently the bearing blocks and the springs I think I saw under those on your press. Restoring this press will be a long term project. Photos can be seen in the classified section here on Briar Press. No documentation, I’m sorry to say. Yes, I remember seeing that a few weeks ago. There are quite a few parts missing but all can be replaced. There should be for example six guide wheels that keep the bed in line, four of one size and six of another. You have the shafts but not the wheels. I had to replace one large and one small one that were broken. A friend at work did a CAD drawing of them for a machinist and they turned out great, no pun intended. They were a bit pricey of course. If you need any measurements, a copy of that drawing, or if I can answer any questions as to what might be missing, etc. I’ll be glad to help. Careful, the feds have no sense of humor…even a joke in a public forum can bring them in for a chat. There’s a story of a printer who purchased, legally, a sheet of bills (I forget denomination) and framed them along with a notice that he earned his money the old fashioned way, he printed it. It earned him an unsmiling visit from a couple of agents. I’ll probably take you up on the offer of drawings, but first I have a few printing projects to finish in the next couple of weeks. I’ll get back to you soon. I hope to attract people with experience restoring old etching presses. I have been admiring your work on cleaning up your presses. I have an old Kelton D-Cylinder rolling press that looks like someone covered it with what I can only describe as Zebart (the rust preventative stuff) thats not what is is but is coated. How do you get cast iron clean to its original finish or bare metal for repainting? I also have a Wesel proof press very similar to your that I also need to figure out how to clean the metal. Too bad your page is on Facebook, since not everyone will be able to see it. Could you post a few pics here?